"You Can't Scream!" is the title of the next comic that I'm working on for Mansion Comics. I've really dived head first into the sketch cards business lately with the new job and all so it's been a nice change of pace to return to drawing comic pages. You Can't Scream! is a horror based script written by Keith Champagne and I'm working on the pencils and inks. I can't say much about it yet but it's a one-shot issue with a 24 page story that involves Demons, 9mm's, fangs, zombies, leather, and a little bit of cleavage. It's been a blast to draw and I'm really happy with the way it's coming out so far. It's tentatively scheduled for an October (Halloween?) release as possibly part of an anthology but that may change. I've added some character sheets below of some of the players. If I get word at any point to start showing some artwork, I'll make sure to post it up here. Fame: Kristen Stewart Released... and Instantly Sells Out. "Fame: Kristen Stewart" One Day Sell-Out"
Ok, maybe not instantly, but one day is still pretty good if you ask me. Though I don't know when, I do believe there will be a second printing of this book that I did the Pencils on. In the mean time, there will be a flip book released next month with both issues of the Robert Pattinson edition and the Kristen Stewart Fame issues back to back. Order at Amazon here. Update: I've been asked if I will be selling my original Penciled pages for the Kristen Stewart and Taylor Lautner books. Yes. I'm working on updating my website and will have a page just for this purpose. I will need to hold off selling the Taylor pages until the book is released. I will post here when everything is up. Update #2: No, sold-out doesn't mean no longer available. It just means that all the copies printed are reserved or accounted for. You can still get them at comic shops or book stores or wherever they are sold, it's just that if the stores run out, they can't reorder any. Yeah, This Is A Tough Job. I'm finally back to working on the Fame: Taylor Lautner comic after a vacation and a few other small jobs that needed to get out. Luckily, the Fame book has a nice extended deadline I can work around and there are only a few pages left to draw. Like the Kristen Stewart book, which I believe comes out at the end of this month, there are a few pages that reference the Twilight series. 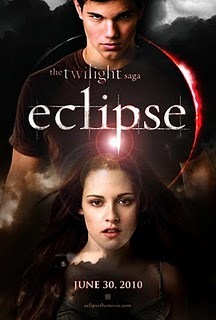 Including one page that has a scene from the new movie Eclipse just released this past week. So I packed up a clip board, paper, and a pencil, and headed off to a matinee. I figured of all the pages I need to get right, it's the Twilight ones. Because I know there are a lot of "fans" out there that would call me on it if I get them wrong or have something off. And, as a general rule, I like to think if your going to do something, do it right the first time. There I am, sitting in the middle of the movie theater, taking notes and doing really quick sketches and thinking... "this is the job for me." Where I get to go to the movies and draw for work. Now I'll just match up the script, my sketches, notes, and images I've already downloaded and I should be able to come up with some artwork I'm happy with and feel comfortable knowing I've gotten it right. So there's a brief look into one of my days. Just a few more pages and I should have this book wrapped up. 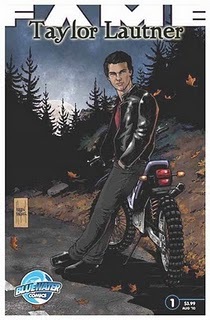 Bluewater has officially announced the Fame: Taylor Lautner comic on MTV's Splash Page and have previewed the alternate cover I did for the issue and a few pages of my interior pencils and the colors for the first 3 pages. ~from the article... Arriving on shelves in August from Bluewater Productions, "Fame: Taylor Lautner" promises to chronicle the once-unknown actor's meteoric rise in Hollywood, including his pre-"Twilight" years and upcoming roles. I'm currently working on the pencils and it is taking up most of my time which is why I haven't been posting as regularly as usual. It's scheduled for an August release and you can now pre-order the book here at Amazon. check out the MTV link above or at the Bluewater site for much more info. Bluewater has officially announced the Fame: Kristen Stewart comic on MTV's Splash Page and have previewed both covers and a few pages of my interior art. 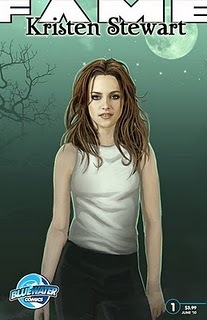 Writer Kim Sherman, who has also penned Bluewaters’ Robert Pattinson entry in the series, said that Stewart’s versatility and talent might surprise readers who only know her as Bella. 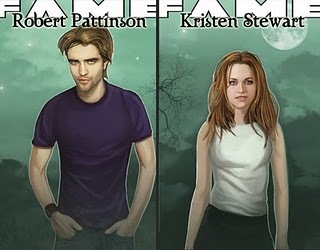 This cover is by Juanmar Studios (which attaches like a double page spread to the FAME: Robert Pattinson issue) and the alternate cover was done by artist Randy Green. It's scheduled for a June release and check out the link above or at the Bluewater site for much more info. ... And you can now pre-order the book here at Amazon. Please do, you'll be helping me out directly if you do. Thanks. Update 3/19: Well, I was pretty surprised with how quick and how far the news spread about the book and the amount of press it garnered all over the web. The NY Daily News even picked it up.